Russian President Vladimir Putin's gift to Philippine President Rodrigo Duterte. Road users of the Subic-Clark-Tarlac Expressway (SCTEX) were left in awe after seeing the Ural trucks rolling down the road beside them yesterday. Last May, Duterte flew to Russia for a four-day ‘landmark’ visit to seal bilateral agreements on security, legal assistance and trade. The agreements include defense cooperation, military and technical cooperation, a treaty on mutual legal assistance in criminal matters, a treaty on extradition and a memorandum of understanding on cooperation in the field of security between the two countries’ national security councils. Defense Secretary Delfin Lorenzana, who also took part in the groundbreaking ceremony in Bulacan, told reporters that a Russian ship would deliver the rifles and other equipment on October 22. Meanwhile, the official turnover of Russian equipment and arms would be on October 25, Lorenzana said, adding that the armaments were donated by Russia to the Philippines with no conditions attached. “Ang mga equipment na ibibigay nila sa atin ay 5,000 Kalashnikov rifles. It has about one million rounds ng bala at saka 20 units ng army trucks, yung malalaking truck. Yun ang ibibigay sa atin,” Lorenzana said. “Grant iyan at no cost. Gusto nilang tumulong sa atin to fight terrorism. Sila rin kasi is also fighting terrorism sa kanilang bansa and they want to help the worldwide fight against terrorism. Iyan ang kanilang rason,” he added. 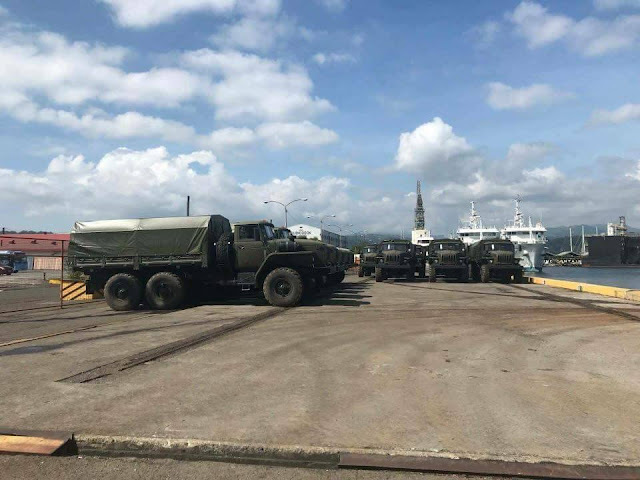 Subic Bay Freeport – Two Russian vessels arrived here on Sunday to deliver the donated military equipment as part of the growing partnership between Russia and the Philippines under the Duterte administration. This is the third visit of the Russian naval fleet in Duterte’s term. 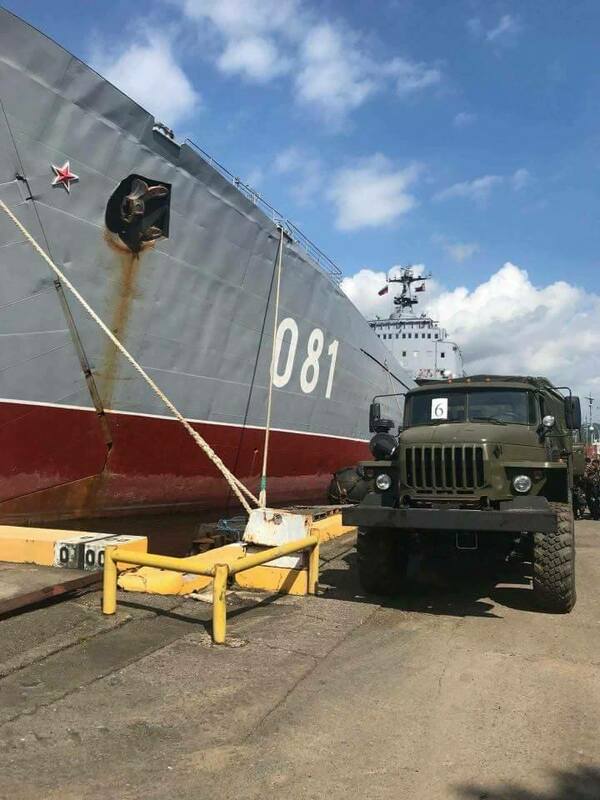 The Russian Alligator-class Landing Ship 081 “Nikolai Vilkov” and the salvage tug “Foty Krylov” docked at the Alava Wharf and unloaded the donated Ural 4320 military trucks. The 20 Ural trucks were loaded with 5,000 high-powered rifle and one million bullets that were also donated by Moscow. Road users of the Subic-Clark-Tarlac Expressway (SCTEX) were left in awe after seeing the Ural trucks rolling down the road beside them yesterday. According to Russia’s Pacific Fleet spokesman Captain 2nd Rank Nikolai Voskresensky, a group of the Pacific Fleet’s big anti-submarine vessels consisting of Admiral Vinogradov and Admiral Panteleyev as well as of the large sea tanker Boris Butoma docked in Manila. Voskresensky said that the visit takes place as part of the program on the development of international military cooperation. During the visit of the Russian warships to Manila, Philippine officials, foreign diplomats and local residents will be allowed to take a tour of the large anti-submarine vessel Admiral Panteleyev. The actual Ural 4320 8-ton 6x6 trucks, unloaded from the Russian Navy Alligator-class Landing Ship Nikolai Vilkov in Subic Bay Freeport. All items are brand new. Photos courtesy of Mr. Justin Dupuis via Max Defense Facebook page. "Those truck are proven on all road conditions in Siberia. Compared to American military trucks, I'm in favor of the Russian made." "Ito yung truck na nkita ko sa youtube na umaandar at umaahon sa maputik n kanal n lubog halos kalahati ng katawan nia at sa ilog." "Pretty huge truck.. perfect for mountain roads."